Editor’s Note: “The Shopping Experience” is an occasional feature whereby we purchase an actual product from an ecommerce merchant, and then critique the process. For this installment, contributor describes his purchase of a jacket. Summertime requires summer clothing, and I was in need of a light blazer to keep myself looking spiffy while meeting with potential clients. A friend suggested Old Navy, and it turned out to be a good tip. 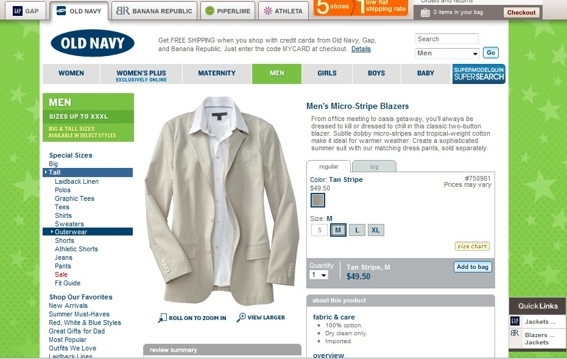 The Old Navy website has a clean design that emulates the feel of its brick-and-mortar stores. It’s not a perfect website, as we’ll see, but overall the shopping experience was positive. 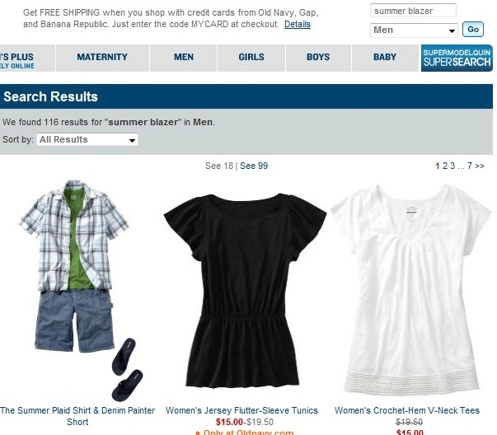 When I arrived at the home page of OldNavy.com, I had a good idea of what I was looking for. The site has a drop-down menu for subcategories that defaults to “women.” Via the drop-down, I changed the focus to “men” and then focused on the site’s internal search. The most accurate search phrase I could determine was “summer blazer.” The result was a lot of summer items and no blazer items. Interestingly, the result also included women’s items despite the fact that I was (supposedly) filtering the results to be only for men’s. 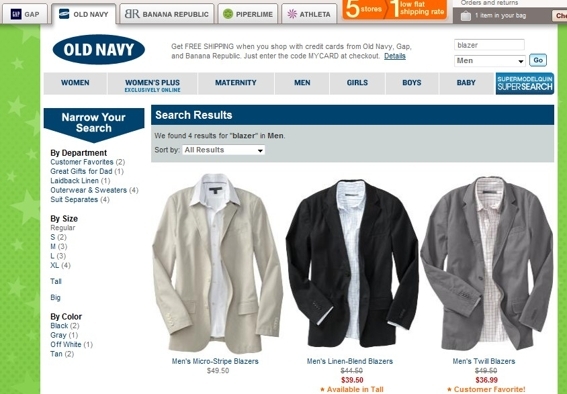 Search results for “Summer blazer” while defaulted to “Men’s” category. I then tried the less-specific term “blazer,” and the summer blazer I had envisioned came up in the top search-results position. Perhaps the phrase “summer blazer” is not accurate for my search, but it is a commonly searched term on Google (versus Old Navy’s internal site search), according to Google AdWords keyword tool. Regardless, I was happy I’d found a jacket within two searches. A nice feature of the website is the Quick Look interface. By mousing over a photograph of any item, a Quick Look button appears. By clicking on it, a popover box appears with more details about the item as well as a link to the item’s dedicated page. The same dedicated page can be reached by simply clicking on an image as opposed to the Quick Look button. But I found most of the information I needed in the popover box. The page dedicated to my summer blazer had even more information about the item. It comes in three sizes (small, medium, large), as opposed to the usual numeric jacket sizes of 40, 42, 43 and so forth. I know that I’m a 42 Regular, but when it comes to generalized sizes, I tend to be between medium and large. 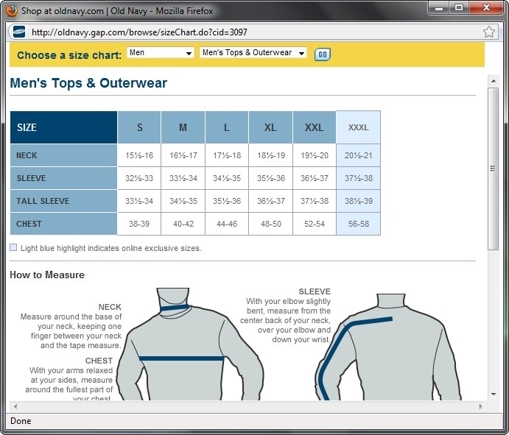 Luckily, Old Navy has a size chart link on the page, which gives more detail via a popup window on what its generalized sizes mean in specific measurements. I determined that a medium size would be the best bet for me, and hit the “Add to Bag” button, which is a catchy way of naming the shopping cart mechanism. Old Navy’s shopping cart is fairly standard and easy to use. However I’m never fond of being forced to create an account with an ecommerce site in order to spend money there. I prefer to quickly enter my credit card and shipping information, and then leave. But a user name and a password are required in order to shop at Old Navy. I would have preferred to avoid that step. The shopping cart is nevertheless intuitive, well designed and the shipping options are made obvious. I chose the standard $7 shipping option. I received the blazer in eight business days, which is acceptable, though a little longer than I would have anticipated. The blazer came nicely boxed, as was as advertised on the site. The overall experience was positive, and I plan on returning to the site for future purchases.